Home Fly Fishing Fishing Flies With Spinning Tackle? Fishing Flies With Spinning Tackle? I am frequently asked this question, “Can I fish flies with spinning gear?” My answer is usually another question, like, “Why would you want to?” I consider fly casting with balanced fly fishing tackle to be an integral, as well as an enjoyable part of the fly fishing experience. Fishing with Capt. Mel this week we had a situation that has happened on other occasions. The circumstances seemed to favor flies, but Mel was reluctant to put down his very reliable and familiar spinning rod. Learning to cast a fly with a fly rod in the middle of a hot bite is not a good idea. The area we were fishing had an assortment of predators hammering a large school of baitfish dimpling the surface. We were drifting over grass in four to five feet of water. An early morning incoming tide was beginning to accelerate. Trout, bluefish, ladyfish, jacks and mackerel were hitting on almost every cast. 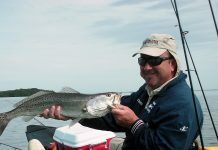 His Old Bayside Shadlyn tail on an eighth ounce jig head was being bitten in half every third or forth cast, probably by the blues and mackerel. A lot of time was being wasted replacing tails. My eight weight fly rod had a clear sink tip line with a thirty pound hard Mason tippet leader. A loop knot in my tippet sported a synthetic hair chartreuse over white clouser deep minnow. The bigger trout were close to the bottom and really liked the fly that closely represented the size and color of their plentiful food source. We were trying to target large trout, but we both enjoy anything that pulls! A quick search of my tackle bag resulted in an eighth ounce red jig head that I had dressed with white bucktail. The end of his ever-present fifteen pound test Power Pro was attached to four feet of Mason thirty pound monofilament. The jig was tied to the mono with a loop knot. At the jig hook’s bend, I tied an eight inch length of the same Mason mono, with a clinch knot. The free end of the Mason leader material was used to secure a size one Clouser minnow exactly like the one I was using successfully. Barbs were all bent down and he proceeded to duplicate my fly rod retrieve, which was slow and close to the bottom. Since the points of both jig and fly were pointed upward, the rig was weedless. His fly had immediate success. Occasionally a fish would hit the jig, but the fly clearly was the better producer. 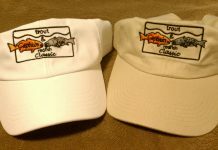 When reeling in a trout, his following buddies would occasionally hit the second artificial, resulting in a double. What a pleasant surprise! Both fly and jig held up well, but the jig’s natural deer hair took a beating. A synthetic white hair dressing, like Neer hair would have been a better choice for the jig. When we finished, both jig and fly were on his spinning rod, and I gave him a few chartreuse and white synthetic hair Clousers to use in the future. This technique can be easily customized, even further improving its effectiveness. The jig can be different weights, colors, shapes, natural, or synthetic hair dressing, with or without some flash. A plain jig head will provide the casting weight, but not the attraction. The length of monofilament joining the fly and jig can be adjusted. Your choice of flies is endless. Use only flies with straight eye hooks, and have some weighted as well as without weight. A heavier fly will have the jig riding higher in the water column. A light fly, especially heavily dressed, with a heavy jig will do the reverse. A heavy jig with a lightly weighted fly will cast better. Lengthening the monofilament between the two will require a slight adjustment to your casting technique to avoid tangles during the cast. Lob the cast a little. Dressing the fly or jig sparsely will make it sink faster. 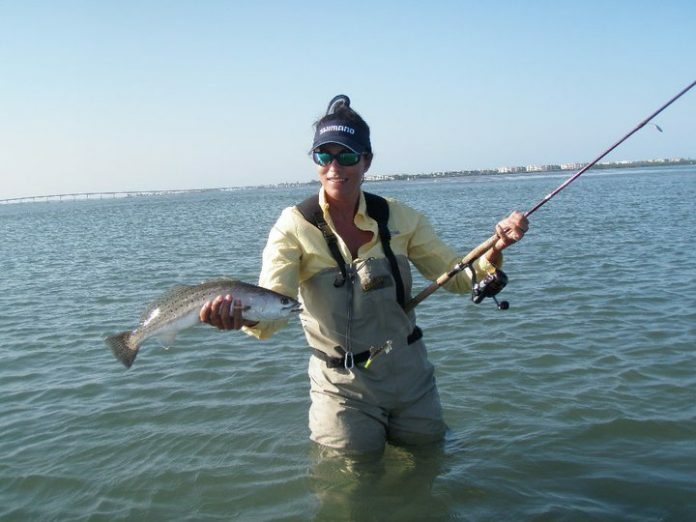 To prolong jig and fly life when ladyfish, mackerel, jacks and bluefish are on the rampage, use synthetic hair as a dressing. Coat the thread with clear Sally Hansen’s, Hard as Nails, nail polish to prevent fraying from sharp teeth. One of my greatest pleasures is getting someone started in fly fishing. This technique, if nothing else, will show you the effectiveness of a fly. Hopefully, it will stimulate your interest in taking the next step, getting a fly rod, and learning how to use it. As a FFF certified fly casting instructor, I feel learning to cast well is not only an integral part of fly fishing, it epitomizes fly fishing. The step by step process gives the participant a great feeling of accomplishment and adds to the pleasure of the sport. Some of our best casters do much more casting then actual fly fishing. Fly casting is their enjoyment. Catching fish is not even a close second. Refining their cast is a learning experience; mine has been going on for over forty years. I welcome your feedback on this technique. There are many, disadvantages when using a spinning rod, to “cast” a fly, but that is a subject for another article.